Nothing says “spring” like flowers, so why not add a floral design to your jeans, shirt, or jacket? Try roses by themselves or with stems, clusters of lavender, a sprinkling of blue bells, or another favorite flower to incorporate some colors of nature. Like flowers, leaves can add a pretty pop of nature to your outfit – especially if you like green. Leaves can be created in a wide variety of sizes and shapes, from scalloped to serrated to tripartited and more, and in many different shades of green to add a soft or bold look. 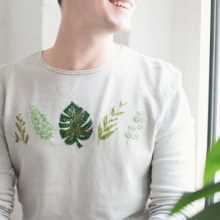 To really get into the spring spirit, try embroidering things like birds, bees, butterflies, raindrops, trees, grass, and more. Here, you can get creative and create entire scenes, use the objects in a pattern, or keep it simple by adding an element to a pocket or collar. One of the most popular types of embroidery is Native American-influenced embroidery. These patterns include triangles, crosses, diamonds, stripes, chevrons, feathers, and more and typically feature colors like turquoise, blue, tan, brown, red, and orange. 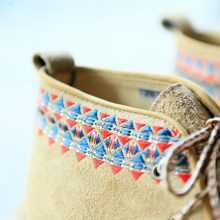 Try a Native American patterns look great on a jean material for the best look. 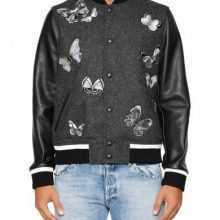 Instead of traditional embroidery, why not try embroidered patches? Our experts can help you turn any image or artwork into a patch that you can iron or sew onto your jeans, hat, jacket, shirt, tote bag, and more. We offer a wide variety of thread colors and patch types to fit your needs. 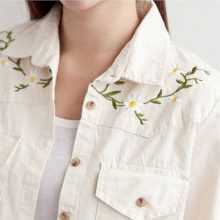 This entry was posted in For Fun and tagged clothing, DIY, embroidery, spring, thread.